Where casual waterfront dining is yours to enjoy. 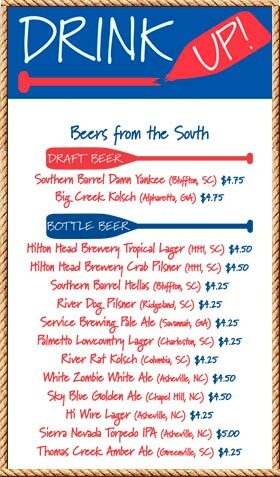 Our deck overlooks the water, lowcountry marshes and the daily parade of boats...Open 11am-until - 7 days a week! Drink UP! and Chow Down! 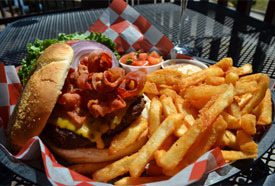 Up the Creek Pub & Grill has affordable prices and is just the perfect UP! 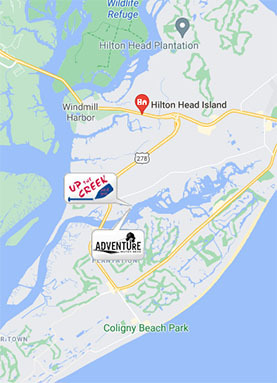 waterfront dining adventure...a family-friendly Hilton Head restaurant. Come on UP! when you plan your ziplining tour, aerial adventure ropes thrill, dolphin tours, kayaking, parasailing, charter boats or ferries to Daufauskie Island, all leaving from Broad Creek Marina next door. We make it a full, fun, UP! day for a Hilton Head Island vacation.